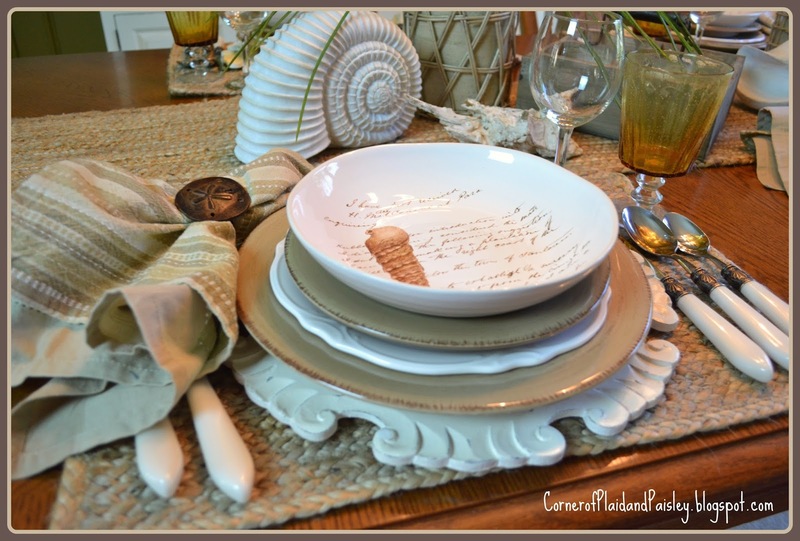 Inspired by our vacation last week - I decided to put together a Sea Shell Tablescape. While we did not spend a lot of time at the beach - we did spend a wonderful evening watching fireworks with our friends while dangling our feet in the ocean. As much as I love the beach - I am not really a beach person. I am a red head - I burn! One day at the beach can ruin a whole vacation for me. 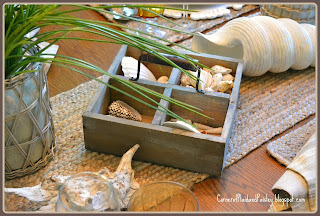 I love the sand, so I decided to stick with neutral colors for this table. With some sand dollar napkin rings. I thought these chargers had kind of a wave look to them. The potted greenery is my attempt for some beach foliage! I really like the way this table came out - too bad I have to take it down right away - because I have the carpet cleaners coming tomorrow and I have to clean everything out of the room! I am going to make a shout out to my friends Elsie and Linda at Butterchurn Kitchenwares in Walnut Creek - one of my favorite places to shop! It was nice talking to you today! Thanks for stopping by and I hope you have a wonderful summer weekend! Your table is just beautiful. The shell theme is perfect this time of year. We live in a small cottage with just one table for eating - no kitchen table. I set a lovely table each night - not as much detail as yours, but would love to be able to set a beautiful table and enjoy it for several days. My sister keeps her dining room table set beautifully all the time because they rarely eat there. Those chargers caught my eye right away. They do look like waves. The whole table setting is lovely! What a shame you have to take it apart so soon. Ann, I love this table! I think we all have the beach on our brains! I just shot a beachy table, but have not posted it, yet. I know what you mean, about having to take down a tablescape quickly. When I shoot in the dining room, it is not much of a problem. However, when I shoot one at the breakfast table, I have to take it down or remove it briefly. We actually eat at that table every day! Those chargers are perfect for your theme and I love all of your shells and those bowls are wonderful. I, also, like your choice of a neutral color scheme - it reminds me of sand! Ohhh you make me miss florida...Love this table! What a beautiful, creative table. It definitely invokes summer and relaxation. Hi Ann....I'm your newest follower! I'm visiting from Life On Willie Mae Lane. You left me a sweet comment on my beachy tablescape a couple days ago. I decided to hop over to your blog and check it out and I am so glad I did! Your beach table is stunning! I enjoyed reading some older posts and am in love with your craft room! I see you are from Ohio.....I just returned a week ago from a trip to Pennsylvania and Ohio. The country is just gorgeous there. I visited Holmes County and stayed in Millersville. I fell in love with the area. I'l definitely be back again! I love this gorgeous beachy table setting. So beautiful. I should spend more time decorating a table when we have people over for dinner. Thank you for the inspiration and for stopping by my blog the other day. Have a great week. Your t'scape has a wonderful relaxed feel to it which corresponds to a day at the beach! 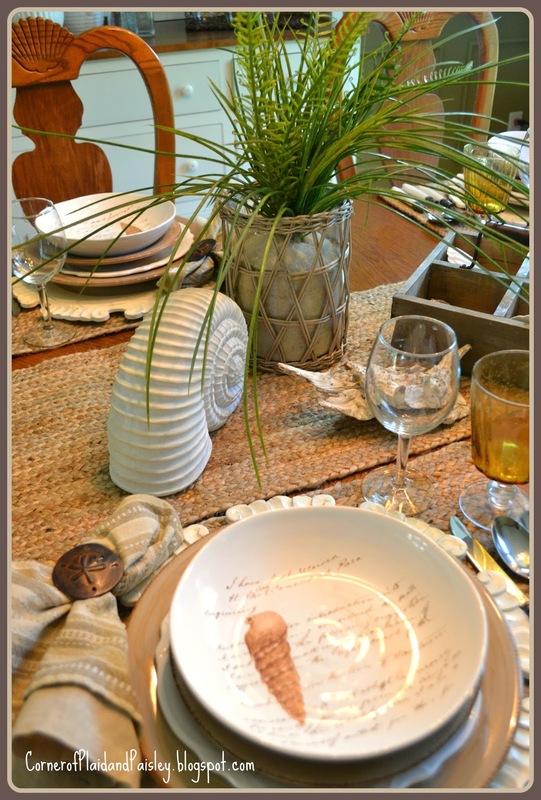 Love the grasses and the shells along with the shell plates! Seashells are one of my favorite natural "elements". Your table is so pretty. I really like the neutral color scheme you chose. 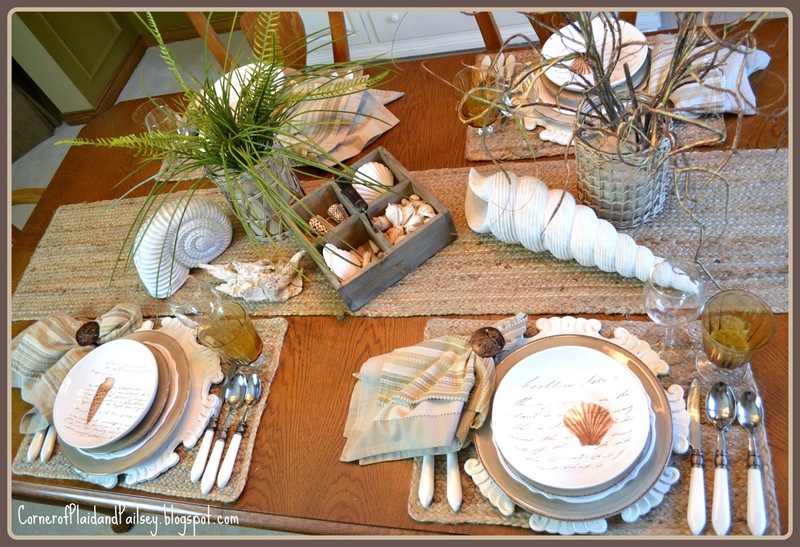 I always love to see tablescapes inspired by the ocean...the place setting is beautiful and I so love those chargers...Saw them at Pier One a long time ago and so admired them!..The centerpiece is so very pretty with those large shells and foliage! Just love it! 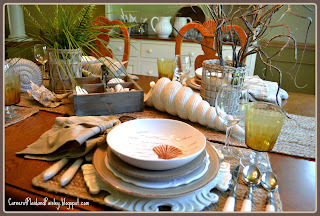 hi Ann, I love everything sea shell, and your table is no exception! 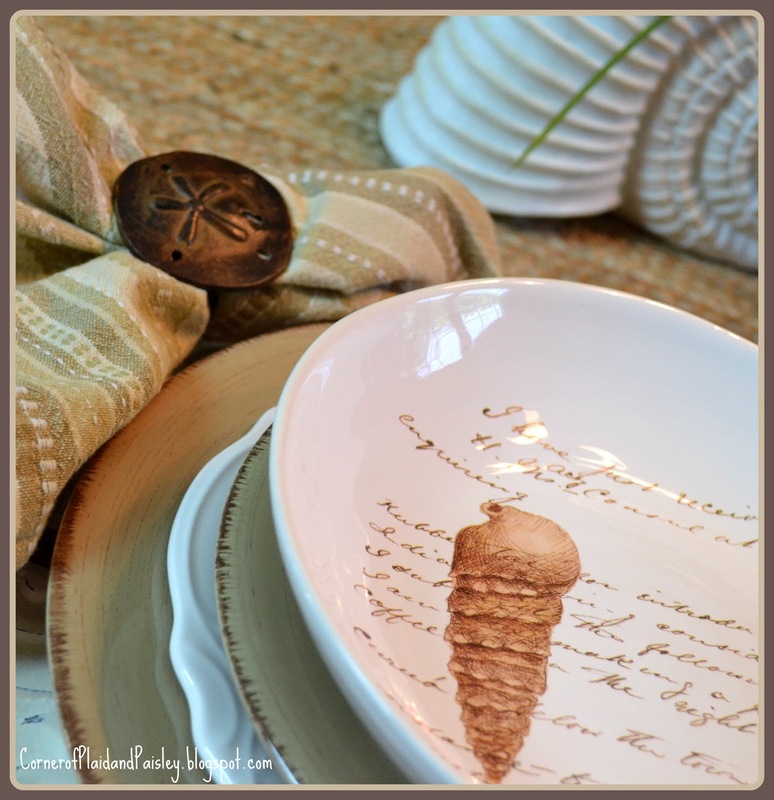 I love how you have kept to the neutrals, it all looks so fresh and natural~I have serious plate envy, what does it say on the plates? The writing of the plates are a bit hard to make out, but from what we can make out they seem to be excerpts from a journal of either an explorer or a scientist. Not real romantic but interesting! Love your beach them, Ann! My poor dad, the Irishman, would burn in the sun, too, and have to be all covered up! I'm glad we could see your pretty table before the carpet cleaners come by. You should have told those pesky carpet cleaners that they needed to figure out a way to work around your table so you could continue to enjoy it!!! :-) Oh, if only! But now that the carpets are all clean, you can set your table again and enjoy it for as long as you like! I love the combination here. The sand dollar napkin rings are really unique, and the dishes are in the LOVE column for sure!!! How pretty! Great use of the table runner with its natural, nubby look, and the sectioned wood box with the shells is a great addition to your centerpiece. I'm not much of a beach person either, but I could definitely sit down to enjoy this beach-y feeling table with NO problem!!! What a fantastic table, Ann! It's a perfect take on the beach theme. I love the colors and all your accessories. Hello there! I finally had some time to check out your blog, we met (I work at Amish Country Peddler/Homespun Treasures) :) LOVE your blog, you are so talented. I'm still wiping the drool off my face and desk from the post of your craft room!!!! LOVE! LOVE! LOVE! Very pretty! I love the seashell theme. Your shell dishes are wonderful and I like the chargers too. I also love that big seashell in the middle. Love how you have pulled it all together so well! 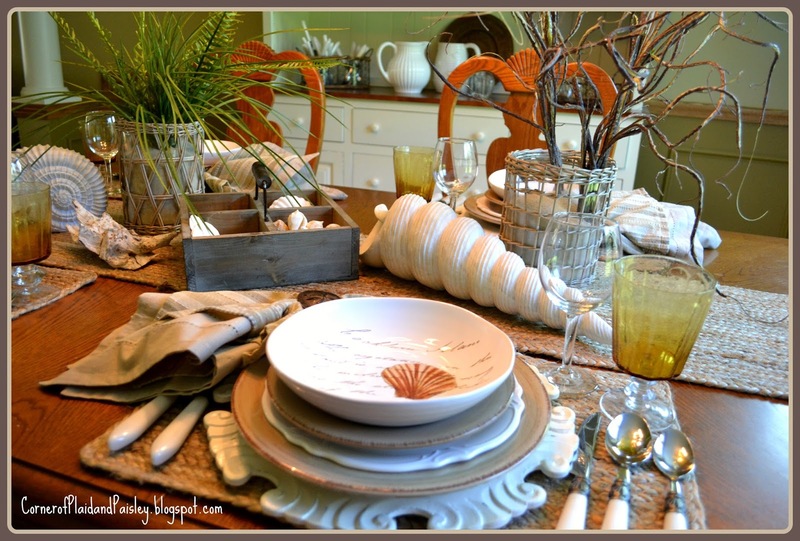 Beautiful seashore themed table, Ann. I love the runner...and of course those wooden chargers that I was too cheap to buy!